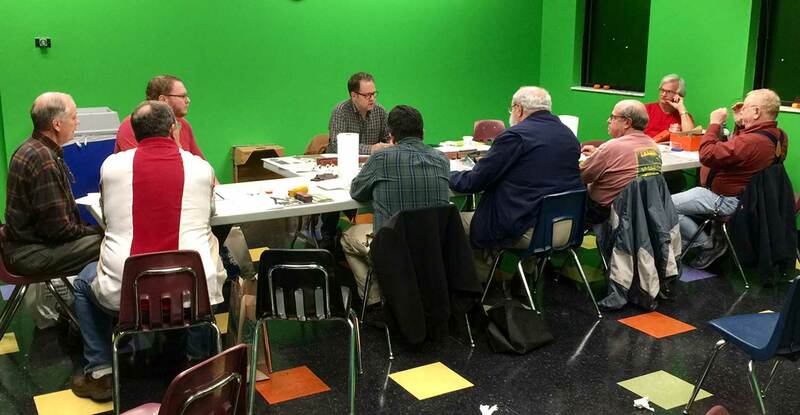 More people were added to the email exchanges and a time was set for the demo in a classroom at the Nashville Adventure Science Center. 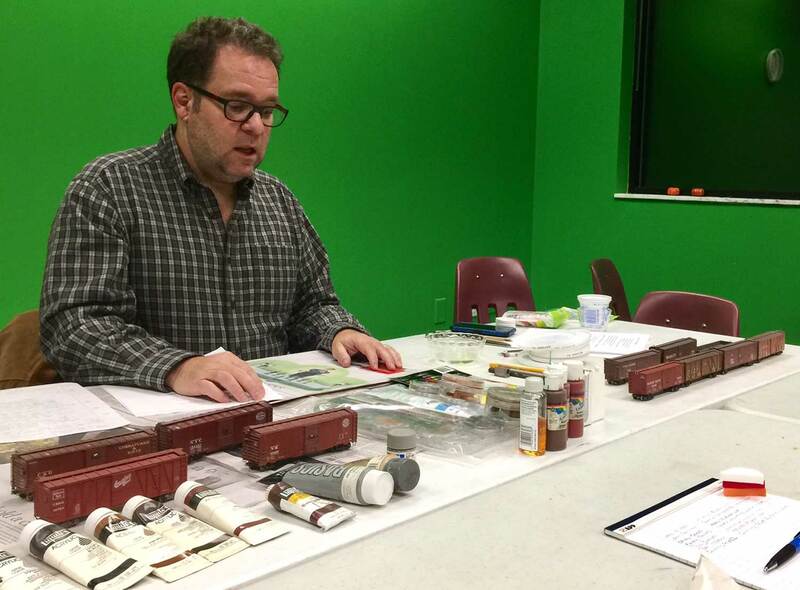 Nine people attended and almost everyone brought a couple of freight cars and artists paint brushes for the demo. I find the hands-on approach to weathering breaks down anxieties people have about applying dirty washes or powders to freight cars. We were in the Green Room and it was very green. The presentation kept to the basics and started with applying an acrylic wash of neutral grey or burnt umber to a freight car. Pan Pastels applications were next with a focus on dusty grime along the car sill and sooty grime on the roof and along the top of the car sides. A second freight car comes in handy as the first one remains damp from the acrylic wash. Although I repeatedly stressed working from prototype images, I did not have any at hand for the demo. For a first weathering experience, it’s important for a modeler to see how the materials are applied and how they can be worked onto the model surfaces. We wrapped up by adding highlights with light grey Prismacolor pencils. The demo went a little longer than expected but the attendees were enthusiastic with many questions and comments about the various weathering materials. The following day I sent several links to color images on the Library of Congress site. The group conversation continued via simple Reply-to-All email exchanges. I thank Bob Hultman, Horton Monroe, and Quincy Styke for coordinating this session and spreading the word to area modelers. I think we will be getting together again for another modeling discussion and demo. 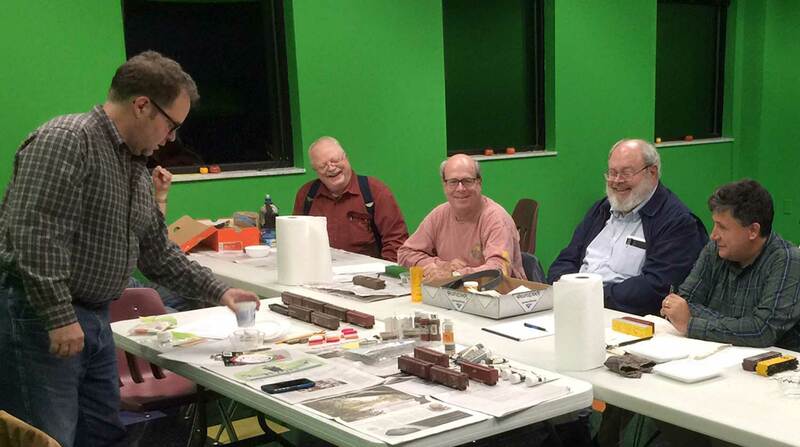 I’ve been fortunate to meet many model railroaders with each move to different parts of the country. I’ve learned a great deal over the last decade and five home cities. I’m always thankful for the hobby and prototype information people have shared. I try to turn that around each day by sharing details, encouragement, and enthusiasm with other modelers I meet. It’s a great hobby of interesting people with varied modeling interests. The hobby friends and experiences of past years are running through my mind as we celebrate our first Thanksgiving in metro-Nashville. I encourage readers to help another modeler when a question is asked or if assistance is needed. We grow the hobby with each personal act. Always love to read about other’s weathering clinics. So, about the Liquitex acrylics….I assume you are using them for washes, yes? Any ratios of paint to water you suggest? Techniques? I’m an AK washes/PrismaColor pencil/PanPastel guy myself (I gotta get back into doing more). Would love to know more about your process. Hey Ralph! Thanks for stopping by and commenting. Yes, I use the Liquitex acrylics for the washes. They dry pretty quick and the colors are easy to find. These were also what I had at hand for the demo. Three basic materials were covered along with the application of those materials. I wanted to encourage the attendees to keep using the basics and become comfortable with the processes. I have seen the results people achieve using the AK Interactive products but I have not yet used them, nor have I seen them for sale. Thanks, Eric! Sounds like a plan! 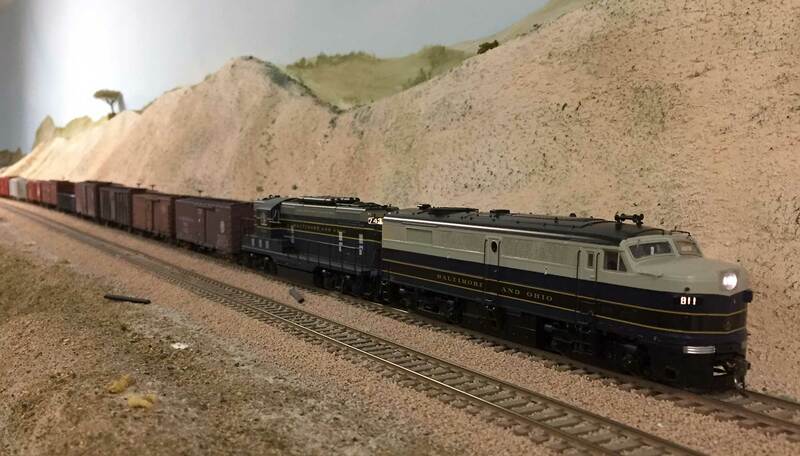 Mr. Dalberg may have a bunch of different weathering clinics to schedule, I was thinking of doing the same thing, I can only talk about a model railroad that doesn’t run so many years in a row! This sounds like a great intro to weathering. I tend not use the acrylics for washes, only because I’m in the habit of using artist oils. One of the things I dislike about using oils is the drying time and the smell of turpentine I use for thinning. I’m going to experiment more with acrylic washes. Do you use anything to break the surface tension when you thin your acrylics? Thanks for your comment, Hunter! I use a drop of Dawn dish detergent in the distilled water to cut the surface tension. Ad the drop first then mix in as you add the distilled water. A little goes a long way. I also like oils but the drying time can be lengthy if you live in a humid climate. The acrylics dry a bit quicker. Using a hair dryer set on low may speed the process. – Eric H.